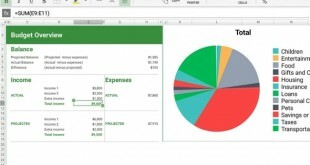 Independent developers are coming out with some of the most unique and innovative games each year. More and more, we are seeing the spotlight turn away from buggy, triple-A releases and focusing instead of these incredible indie experiences. However, with so many releases, it can often be nearly impossible to keep up with, let alone play every indie game that releases. Here are five indie games that you cannot afford to let slip past your radar. These five indies are the type of games that if you don’t have the time to play, you make time. Transistor is a special game. 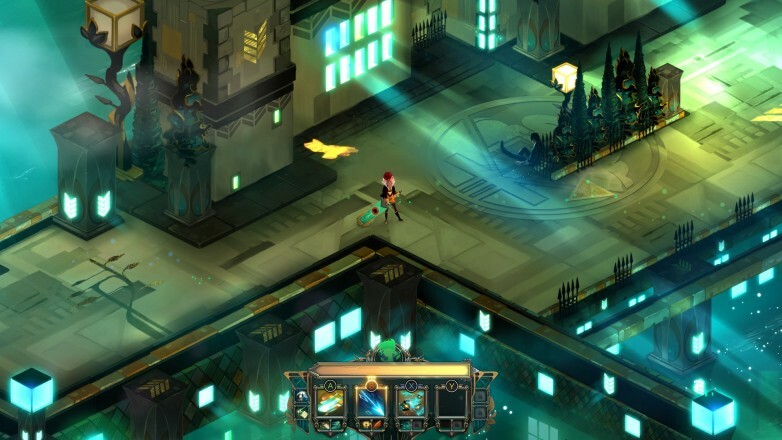 Developed by Supergiant Games, who previously created the masterpiece that is Bastion, Transistor features not only one of the most visually compelling aesthetics of all time, but also manages to take the gold for one of the best soundtracks of all time. Composed by Darren Korb, the soundtrack features beautifully haunting tracks and is just as important to own as the game itself. It is one of the soundtracks that regularly gets played in the car around my household. Transistor follows the story of Red, a musician who lost her ability to speak, and a mysterious sword containing the soul of a murdered man, as they plot to take down the evil Camerata and restore Cloudbank to its former glory. 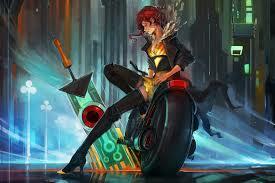 Transistor makes the list not only based on visuals, but also due to the fantastic turn-based combat system. Red can acquire many different abilities during the game and can combine them in various ways to create interesting and unique effects. The visuals, audio, and fantastic combat system, which only gets better in new game plus, combine to make Transistor one of the indie games that you cannot miss. Shovel Knight, a retro 2-D platformer. 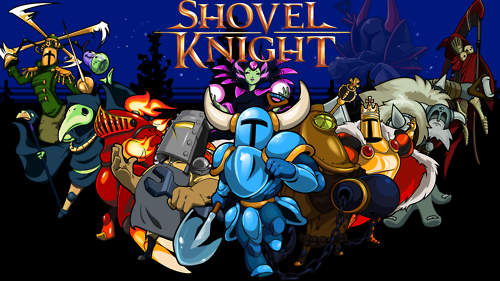 Shovel Knight was one of the biggest successes to come out of Kickstarter. Developed by Yacht Club Games, Shovel Knight is a side-scrolling 3D platformer where the player controls Shovel Knight, who is suffering from the loss of a loved one and decides to give up adventuring once and for all. However, in his absence, the evil Enchantress rises to power and begins to rain darkness and despair on the land. She unseals the very location where Shovel Knight had lost his loved one, and Shovel Knight vows to return to save the life of his beloved. 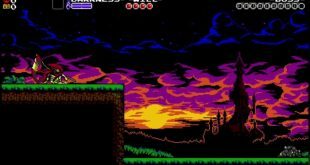 Out of all of the indie platformers, Shovel Knight stands out due to its gorgeous retro visuals, upbeat chiptune soundtrack, and solid core mechanics. The platforming in Shovel Knight never became frustrating. It never felt like there was a death that was not entirely my fault, and I felt that I was in control of my character the entire time. This is not to say that the game is not extremely challenging, because it definitely is. In a world packed with hidden items and areas to explore between levels, Shovel Knight provides an extremely enjoyable platforming experience that is a standout among the pile of indie games that are currently available. FTL, a top-down strategy rogue-like. 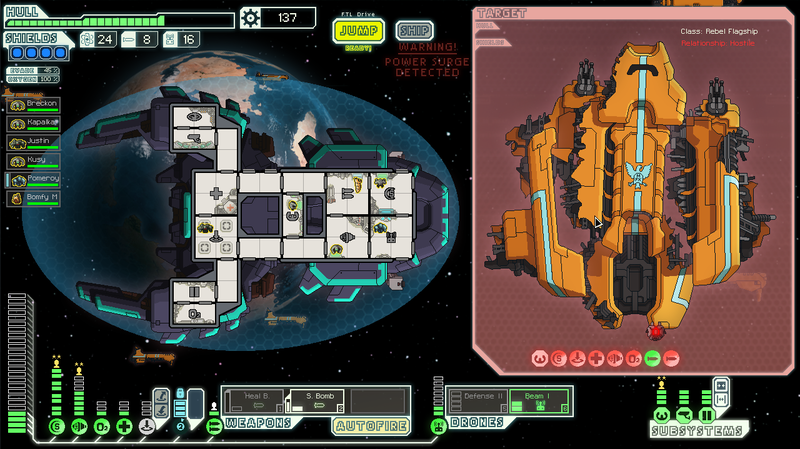 FTL: Faster Than Light is a top-down strategy roguelike developed by Subset Games. The gameplay consists of guiding your ship through eight sectors of space, all of which are generated procedurally as is commonplace in roguelikes. You must use your ship to jump between locations on the map, and the thrill of the game lies in the unknown of what awaits you on the other side of the jump between your location and your destination. With each jump, the fleet approaches, taking up more and more of the map and forcing you to move forward or face the wrath of an entire fleet of enemy ships. The locations that you jump to can contain many random events such a ship battles or stores where you can resupply. The combat is a power management game, where you must decide which systems to transfer power into, all while managing the inside of your ship, including your crew, and making sure that any fires, boarders, or other damage is repaired by the members of you crew. You can also send members of your crew to a particular station to give it a boost which is different depending on the station the crew member is manning. FTL has an insane amount of depth and replayability for an indie title, and is definitely worth a look. With the release of the advanced edition last year, FTL has added even more content to make it one of the top contenders for indie games that you just can’t afford to miss. Magicka, a wizard simulator..of sorts. Many people who know of Magicka will understand exactly why this game is included in this list. For me, Magicka was a source of roaring laughter among my friends, and was one of my favorite games to fire up whenever I was having a bad day and needed a laugh. 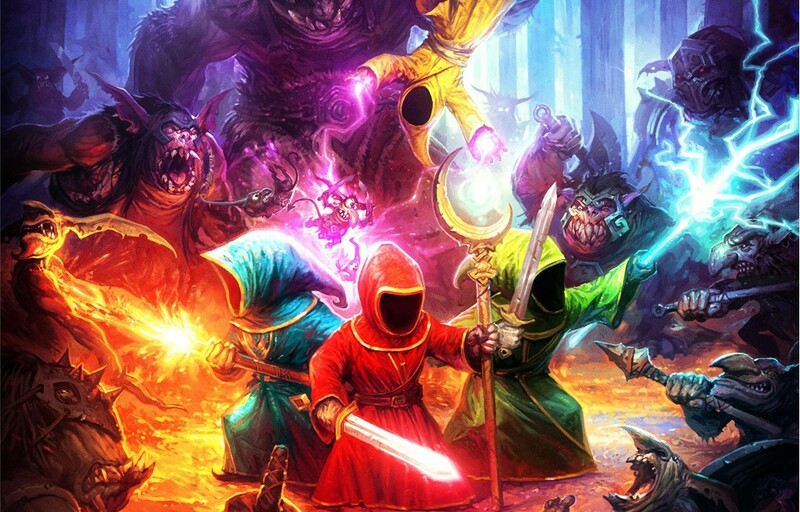 Magicka is an action-adventure game with an isometric perspective developed by Arrowhead Game Studios. The game has you choose a wizard, and with the amount of DLC that is now available for the game, the choices are fantastic and numerous. Once you choose your wizard, you begin your adventure into a world where enemies are everywhere, but so are friends. Magicka is best played with three friends. The co-op is where the game really shines. When you have four friends on the screen, slinging spells (friendly fire is always on) the resulting explosions are one of the most hilarious things ever to come from a video game. The player uses the WASD keys to prime spells, with various combinations being available, such as a meteor shower, fireballs, and a healing spell. You can also modify your spells through different mouse clicks, allowing you to place magical landmines, create shields, or shoot out flaming laser beams of death to char your enemies…or your friends. Magicka’s sense of humor, along with its interesting spell system and fantastic enemy variety, make it a definite indie game that cannot be missed. Also be sure to keep an eye out for Magicka 2, set to release on May 26th. 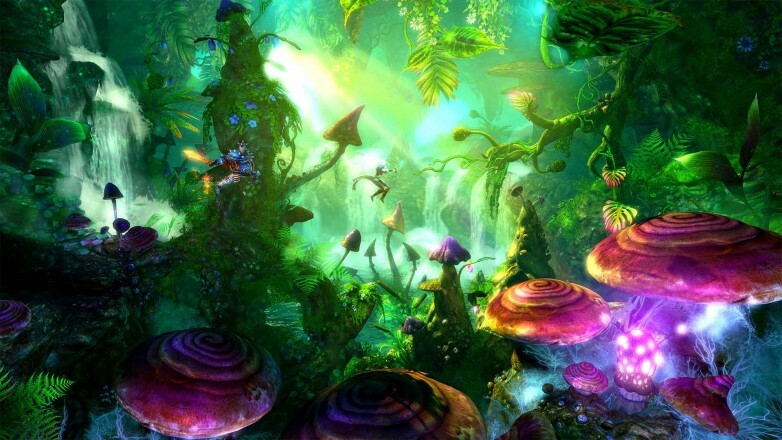 Trine, a side-scrolling action platformer. Trine created one of the most beautiful worlds I have ever had the pleasure of exploring in a game. Developed by Frozenbyte, Trine is a side-scrolling action/puzzle platformer where the player controls one of three characters which can be switched at will. Zoya, the thief, is armed with a bow and has the ability to grapple onto wooden objects and swing to reach the more difficult areas on the level. Amadeus, the wizard, has the ability to create magical boxes and eventually bridges to assist in completing puzzles and traversing the levels. Pontius, the knight, is a brute armed with a sword and shield that he uses to dispatch the skeletons and other enemies that you will face along your travels in Trine. Released in 2009, Trine was one of the first games to show what indie companies were really capable of in terms of creating immersive worlds and writing fantastic stories. The draw of Trine for me, other than the visuals, was the story book narration by Terry Wilton, which left me with feelings of wonder and happiness between the levels. I could not wait to have the story book pop up and listen to the narration between chapters. The ability to change between characters at will, along with the fluid controls, challenging puzzles, and fantastic story and narration make Trine one of the indies that cannot afford to be missed. Indie games are one of the biggest driving forces of our industry today. It seems as if we can’t go a day without at least a decent indie game being released, and there has never been a better time to love video games. What other indies can you guys think of that are must plays?